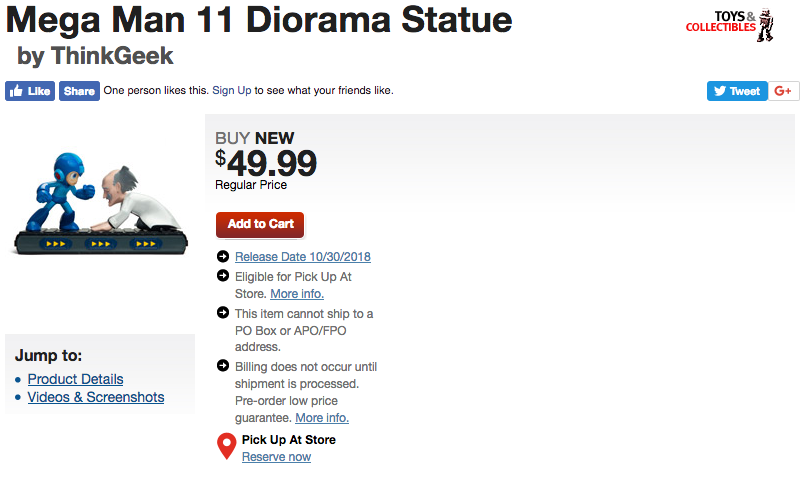 A listing for a Mega Man 11 diorama has been spotted on GameStop. The $49.99 statue features Mega Man standing victorious before a groveling Dr. Wily. Neat! It's expected to ship on October 30th. No high-res images or additional information is available at this time. This appears to be a very early listing – not even Capcom have announced it. Snag a pre-order it here. More updates on this soon. Thanks, Reploid21XX! My uncle works for ThinkGeek, and I can confirm that Dr. Wily is actually crawling on a conveyor belt with Mega Man acting as his personal trainer. No thanks! I dont mind for a 19.99 but a 49.99 ? Its ridiculous and a rip off. How is $50 a rip off? You don't know the size and quality of it yet. Either way, $50 isn't that much for a display piece. Try $750+ for say, the HMO Collectible statues. It looks poorly sculpted in the picture. Ehhh not feeling it. Wily looks more like he's praying than begging and not really a moment I want captured in statue form to begin with. Two things: 1) OMG they spoiled the ending! 2)I wonder if the actual final battle takes place on a conveyor belt? 3) Okay, three things: It looks pretty nice, need more on the size and actual quality to really tell before I can say it's worth $50 or not, it doesn't sound too bad for a diorama of this type. If such details are obvious judging from a single 190px × 190px .jpg (which half is negative space) then man, get a career in typesetting or something lol. Yeah, E3 definitely sucked this year. As underwhelming as some of the others have been for the past five years, I think I can safely say that this one has been the worse since 2008. I guess this could be chalked up to the fact that I'm one of the very few people who no longer cares about Super Smash Bros. Although, I'll admit that Ridley was a nice addition, along with Proto Man and Bass being part of the Final Smash. It would have been nice of Duo could have been part of it, though, but oh well. They made mega man look way too small compared to wily. Going to need better pics for sure.